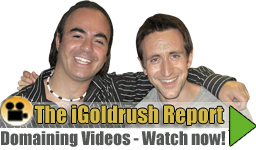 iGoldrush is your source for the most current domain industry news and information. Read the most current domain news below, then visit our news archive for domain news from years past. In addition to domain name news, you’ll find domain articles, information, and interviews with top industry insiders. We’re looking for writers! Contact us to submit your article or editorial for review. We’re Huge Liars. That’s a Fact. Nobody Hates Your Blog? Then You Must Be Doing Something Wrong. Click here to view all news articles. Got something to say? Our readers are eager to hear it! iGoldrush strives to provide content diverse in opinion and outlook and we are currently seeking informative and engaging writers within the domain industry to contribute. In exchange, you'll get exposure on one of the most targeted websites in the industry. Contact us to submit your article or editorial for review. Have you ever leased a domain name? Domain names, web hosting, and email. Special Offer: $3.99 .COM and Free Private Registration. Contact us for details on adding your website here. © Copyright 1996-2019 iGoldrush.com and Internet Goldrush are registered trademarks. All Rights Reserved.